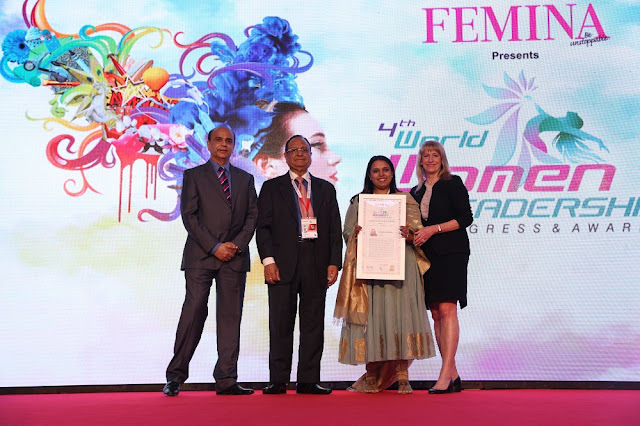 Gunjan Aggarwal, co-founder of Esquared was awarded in the category of "WORLD WOMEN LEADERSHIP" by the WORLD HRD CONGRESS& FEMINA (India’s No. 1 Women Magazine), in its fourth edition. With women being selected and nominated across categories for their relentless commitment to make a difference in the world through meaningful changes and innovation, the World Women Leadership Award 2017 edition, had some distinguished women professionals recognised. The award was presented at the Congress’ celebratory event on 17 February, 2017 at Taj Lands End, Mumbai. The primary objective of this annual ceremonyhas always been about recognizing individuals in various award categories with the objective of benchmarking talent & HR practices. The Key Note Address for the event was delivered by Dr. RL Bhatia, Founder, and World CSR Day. The award was presented to Gunjan by Dr. Michelle Reina, Co-Founder, Reina, A Trust Building Consultancy. This is yet another achievement for Gunjan who previously has also received the ‘50 Most Talented Social Media Professionals of India’ citation from the prestigious CMO Asia & Youth Marketing Forum. This honor is meant for a Digital & Social Media Leader, mentor and master collaborator whose work has earned them exceptional repute, and whose contributions, ingenuity and commitment pushed Social Media to new levels of excellence through their outstanding achievements. The Congress was an Executive Level Retreat in which participants reviewed Evolving Trends in HRM that could change their paradigm on leading people at work. It provided an opportunity to acquire skills to maximize competencies and become a more knowledgeable contributor in the organization. Besides networking opportunities, the conference offered unique in-depth approaches to understanding important workplace issues that affect an organization's viability in today's fast-paced business environment. The WORLD HRD CONGRESS was governed by Global Advisory Council which guided the strategic intent of the congress to its logical success. Esquared is an award winning digital media firm with a direct focus on the educational sector. Working with top-tier educational institutes throughout India, E-Squared delivers high-impact results in digital branding, online PR, content creation, design, student recruitment, alumni and corporate engagement. Gunjan Aggarwal is the co-founder of E-Squared. A teacher at heart, Gunjan has been invited to train online editors for Times of India and performed multiple workshops for executives in digital media analytics. Additionally, Gunjan is the co-founder of the 9.9 School of Convergence. While there, she has been instrumental in launching India’s first Post Graduate Diploma in Digital Media Communication. Gunjan is a Chartered Accountant and MBA from the Indian School of Business, Hyderabad, where she was a Citi Bank scholar. She has worked in advisory roles for Arthur Anderson and Citibank and helped assist Fortune 500 companies to develop business strategies for entering the Indian market. She has also served as a consultant for the Indian School of Business and helped the institution to establish its Corporate Relationship team for North India.